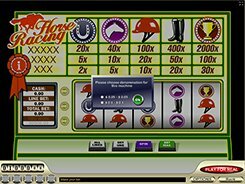 It is now common for five-reel slots to have wild and scatter symbols, more or less detailed visuals and a paytable displayed on a dedicated screen, but it is not the case with the Horse Racing slot developed by Gamescale. 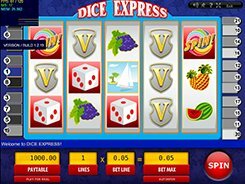 This 5-reel 3-payline machine looks very much like an old-school game and has only 5 regular symbols themed around horse racing, as you may guess. The symbols are a horseshoe, a horse head, a jockey helmet, jockey boots, and a golden trophy. Before getting access to the game, you are asked to choose a range of coin values for the gaming session: $0,1 to $5 or $0.2 to $10. 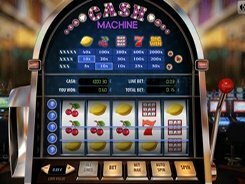 If you prefer the higher limit, then the maximum stake will reach $75 per spin, will all lines activated. To make a winning combination you need to hit three, four or five identical symbols along an active payline. The first, second and third largest prizes in the game are $30 000, $6000 and $1500. As is said above, the slot is devoid of wild symbols, scatters or bonus features; however, Horse Racing will take the fancy of both classic slot fans and 5-reel slot devotees alike, thanks to its unique design and reel layout. PLAY FOR REAL MONEY!